It's often said that it's tough to build stars in MMA. For every one Georges St-Pierre there are countless others failing to make an impact. The formula for making a star is difficult and is more of an art than a science. But every year, a handful of fighters always make enough of an impact to not only make sports headlines but get the mainstream audience talking about them. Let's get the obvious out of the way: Ngannou is about to become the UFC's biggest heavyweight star since Brock Lesnar. The Cameroonian-Frenchman is already a betting favourite (-175) over incumbent champion Stipe Miocic and it's thanks to his record-setting knockout power. Ngannou scored 2017's scariest knockout when he nearly decapitated former Strikeforce and K-1 champion in 90 seconds. He is 11-1 and unbeaten in the UFC (6-0) with all of his victories coming via finish with his last four coming via the first-round. Should Ngannou put Miocic away with a massive KO like odds indicate, the African could be the UFC's biggest new star of 2018. In the UFC's new women's flyweight division there is a basket-full of names to pick as the next breakout star but none of them are bigger than Valentina "Bullet" Shevchenko. The multiple-time Muay Thai champion came within a decision to dethroning bantamweight champion Amanda Nunes, the only fighter she's lost to in the division. She now heads to 125, her natural weight class, where she is expected to run roughshod over the competition. Shevchenko was nicknamed "Bullet" for her speed and power. As a 12-year-old, she knocked out a 22-year-old in kickboxing. 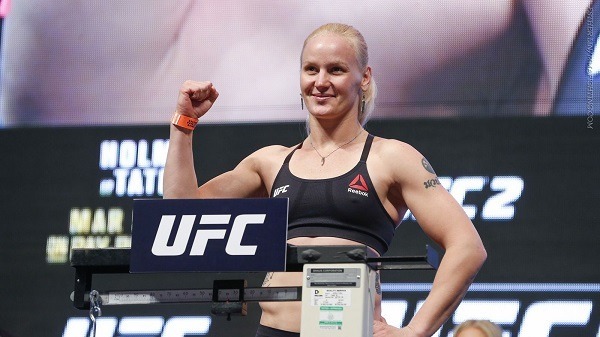 Combining grace and brutality, Shevchenko could be the UFC's next dominant champion. Nicknamed "Borrachinha" (The Eraser), Costa has a case for being the Brazilian Superman given his Clark Kent good looks and herculean power inside the octagon. Borrachinha is 3-0 in the UFC with all of them coming via T/KO by way of punches. In 11 pro bouts, he hasn't tasted defeat and stopped all his opponents with eight of nine getting stopped by punches. Borrachinha also speaks good English and has already called out Derek Brunson. Whether it'll be a card in Brazil, the US or overseas, expect Borrachinha to be on the main card if not a headliner. In a division that is dying for fresh young contenders, Dominick Reyes stands above the rest quite literally. The unbeaten prospect stands 6'4" with a 77" reach and has finished seven of his eight victories. Hailing from California, Reyes works in IT and has the everyman persona most fans can get behind. With two UFC victories and a postfight bonus already under his belt, Reyes could be on the fast track to contender status. Reyes doesn't have any fights officially booked for 2018 yet but given how badly the division needs new contenders, you can expect Reyes to be given a high-profile fight before the year ends. With St-Pierre being inactive for potentially all of 2018, Canada needs a hot new prospect to watch. Enter: Hakeem Dawodu, an undefeated prospect from Calgary, Alberta. Dawodu only began his professional career in 2014 and has already racked up six knockout victories in seven bouts. Dawodu was most recently given a four-fight UFC contract following his biggest win, a unanimous decision over UFC veteran Steven Siler for World Series of Fighting (now called Pro Fighting League). The 145-lb fighter flashes incredible striking and has the style to earn him plenty of post-fight bonuses. Expect Dawodu to be a staple in Canadian UFC events. Hot prospects have impressive debuts but only Sean O'Malley can say he had an impressive debut while lighting a joint with the Doggfather himself. A revelation from Dana White's Tuesday Night Contender Series, the Irish-American phenom is 5'11" with a 72" reach and a fighting style that highlight reel creators salivate about. O'Malley followed up his DWTNCS win with a hard-fought victory over veteran Terrion Ware to set up a premier bout on UFC 222. Seven of his nine wins have come via finish including a spinning wheel kick. Expect to see "Sugar" Sean as a fixture in most high-profile UFC events this year. The best thing about the UFC and MMA is it happens all year round. There are no offseasons! Canadians are enthusiastic MMA fans especially when their own are fighting. They also turn to online sportsbooks, which offer extensive up-to-date lines on all sports, not just MMA.